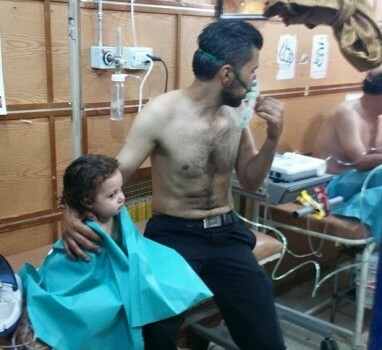 President Assad’s warplanes have reportedly carried out another chlorine attack, this time in Syria’s largest city Aleppo. White Helmets rescuers and pro-opposition activists initially said two people were killed and nine people were injured in the strike on the Zebdia neighborhood. Photographs showed children being treated for breathing difficulties. Later, the Swiss-based medical charity UOSSM says three people died and dozens suffered breathing difficulties, including 25 under five years old. Ten days ago, regime helicopters reportedly dropped chlorine canisters on Saraqeb in Idlib Province, amid almost two weeks of almost constant attacks after a Russian helicopter was shot down. Up to 30 people were injured. Russia tried to counter attention to the assault with the unsupported assertion that rebels carries out their own attack with “toxic gases”. 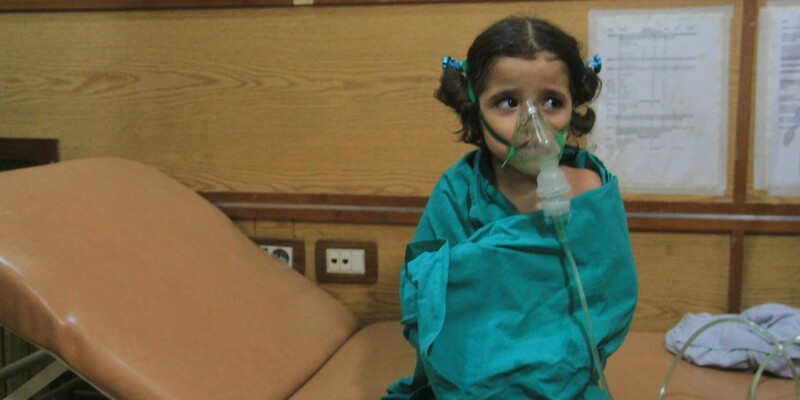 The Assad regime has regularly used chlorine canisters inside barrel bombs, particularly after it was forced to hand over chemical weapons following its August 2013 attack with sarin gas that killed at least 1,400 people near Damascus. Chlorine is not banned under international chemical weapons conventions. Russian State media do not refer to the latest regime attack; instead, they claim — with no evidence — that Moscow’s warplanes “destroyed an Islamic State chemical weapons factory” near Raqqa. Russian State outlet Sputnik, citing a source in the Defense Ministry, says Moscow is planning to expand its Hmeimim Air Base. The source said a barracks, dining hall, and hospital will be built. Extra aprons will be added for warplanes, as well as extra space for large transport aircraft. More artificial hills will also be constructed to secure the warplanes in case of shelling, and squadrons will be stationed in different areas of the airbase rather than in a single lot. Russian experts will arrange sites for Pantsir surface-to-air missile and anti-aircraft artillery weapon systems to provide further protection. The source said the plan was first developed in late 2015, soon after Russia launched its aerial intervention, but implementation was postponed until the “status of the object was determined”. Earlier this week President Vladimir Putin asked the Russian Parliament for formal ratification of an indefinite stay in the airbase. The Kurdish-led Syrian Democratic Forces say they are close to completing the capture of Manbij, the Islamic State’s main position in Aleppo Province. Spokesmen for the US-backed SDF say they have pushed ISIS fighters back into a small pocket in the center of the city. The SDF, supported by intense US airstrikes which have also killed scores and possibly hundreds of civilians, have been attacking Manbij since May. 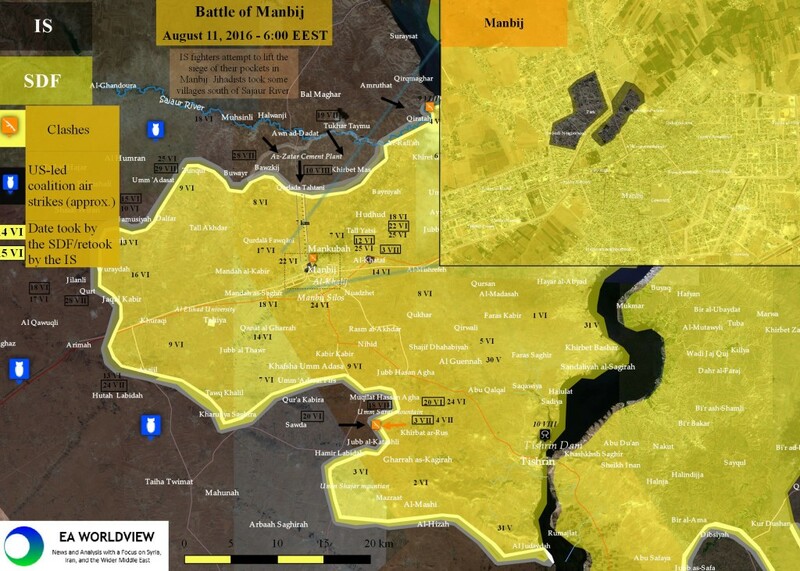 The Islamic State has held Manbij since early 2014. Rebels say they have repelled counter-attacks by pro-Assad forces on the southwestern Aleppo front, inflicting heavy casualties and holding territory gained in the last two weeks. Rebel blocs Jaish al-Fatah and Fatah Halab said regime troops launched attacks at 4 a.m., supported by Russian bombings. The pro-Assad took several buildings in Ramouseh, entered by rebels last week, including the Town Hall and the Ramouseh Garages. However, after reinforcements and rocket attacks, rebels retook the positions by 9 a.m.. A pro-Assad attack on Mahrouquat Hill (see map) also failed. Fatah Halab said that four pro-Assad efforts to break out of a cement factory, east of Ramouseh, were also blunted with more than 60 casualties among the Syrian military and allied foreign units. The factory, used as a garrison by the pro-Assad troops, is near the southern ring road which has been cut by rebels. Syrian State news SANA agency, from a “military source”, is insisting that regime forces took positions this morning near the artillery base and air force academy — captured last week by rebels — and the 1070 housing project. Show its people that how merciful you are. Do not steal the spoils of war, do not ruin any shops, do not burn [anything], do not cause corruption. Do not oppress. For the second time in less than a month, the Syrian military and Hezbollah have expelled hundreds of families from a village in the Qalamoun mountains, according to local activists. 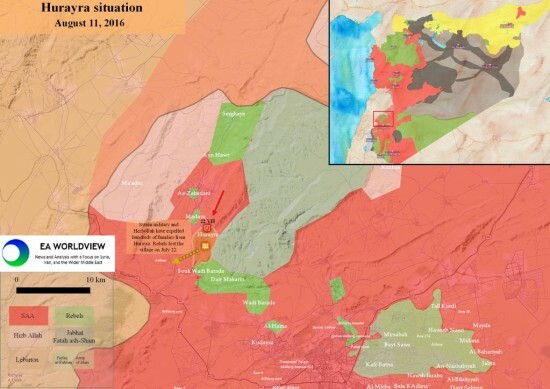 The village of Hurayra, about 30 km (19 miles) northwest of Damascus, is between opposition-held territory in the Wadi Barada region and the besieged towns of Madaya and Zabadani. On Saturday, pro-Assad soldiers with loudspeakers informed residents that they had 24 hours to evacuate their homes. At 12 pm on Sunday, the troops entered the village and “expelled between 200 and 220 families,” said an activist who fled and is now in the Damascus suburbs. The expelled residents were allowed to go to either regime or opposition territory, carrying small handbags and their belongings. On July 17, the troops expelled 400 families under a similar 24-hour deadline. Of the village’s 800 original families, only those with Government affiliations and/or sons in the Syrian military have been allowed to remain. Rebel groups, including the Fatah Halab bloc and the Free Syrian Army, have issued a statement promising cooperation with international humanitarian law. The factions also said they would cooperate with the UN to ensure aid access to all areas in Aleppo city. Last week, amid their offensive southwest of Aleppo which has taken significant positions and broken a pro-Assad siege, rebels issued a statement guaranteeing protection for all civilians in their homes, mosques, and churches. They also promised security for regime troops who laid down their arms. The assurances were repeated in Wednesday’s statement.